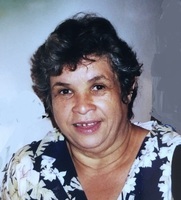 Provide comfort for the family of Aida Luz DeJesus with a meaningful gesture of sympathy. Consider providing a gift of comfort for the family of Aida Luz DeJesus by sending flowers. We encourage you to share your most beloved memories of Aida Luz here, so that the family and other loved ones can always see it. You can upload cherished photographs, or share your favorite stories, and can even comment on those shared by others. I am so sorry for your family’s loss. We are all affected by death, no matter what our age is. The Bible tells us that Jehovah God sees our pain and suffering. And soon he will put an end to death for good. He even promises a resurrection of our loved ones. (John 5:28,29). We all look forward to being reunited with our loved ones. I hope this brings you some comfort during this time of grief. Aida made my wedding veil 26 years ago with her very talented hands. She always had a smile for you even when things were so tough for her. Lastly, Aida loved her daughter Michelle and grandchildren so much and would always boast about them. Rest easy Aida.